When you think of flowers, spring and summer likely come to mind. This is when most flowers are vibrant and in bloom, while they often meet their demise in the colder months. But just because the weather outside doesn’t yield many blossoms doesn’t mean that they are not still available somewhere. Winter and fall floral arrangements are still very popular as wedding centerpieces, as home decor, and just because! Tucked in between vivid red French tulips or roses is a refreshing burst of berries. Create a gorgeous framework for pretty much any bloom by inserting springs of holly, winterberry, dogwood, or pussywillow. If ever there is a time for being deliberate about the way your home smells, this is it. Luckily, winter blooms offer a lot in the way of fragrance. From kumquats and limes to perfumes from narcissus and jasmine, there are many ways you can literally spice up your home. Most of all, don’t forget the wonder power of eucalyptus, which fills your whole house with its spa-like scent. Cedar, pine, and fir can also all have the same amazing foresty fragrant effects. The blooms don’t necessarily have to be winter themed if you want to go floral. 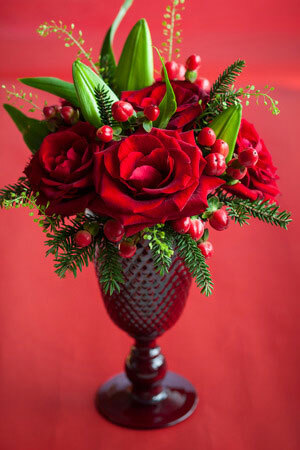 Try using themed vases or wrap regular vases in ribbons for a more festive feel. If the winter clouds, cold, and snow have you down, or you can tell that someone else in your life is feeling them, it may be time to call the florist delivery service and have some flowers delivered to where they are needed most. Fully 83% of people said they like to receive flowers unexpectedly, so don’t hesitate to pay it forward by extending the gift of a beautiful winter flower display.